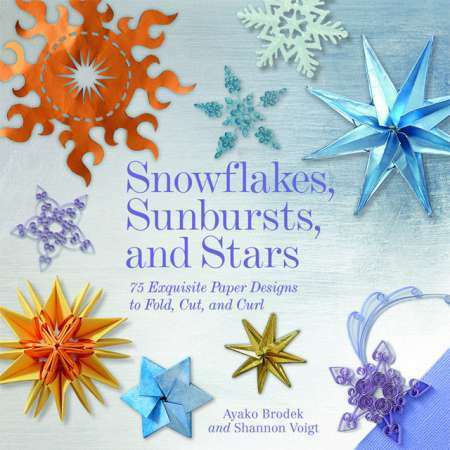 Snowflakes, Sunbursts and Stars- 75 Exquisite Paper Designs to Fold, Cut and Curl is one of those books that just excites me down the core of my paper crafting soul. The reason is because it's kirigami (cut paper designs), origami (folded paper designs) and quilling (coiled paper designs) to create all sorts of gorgeous mandala like designs that can be used for home decoration, on cards or made tiny, as jewelry. It's a nicely made hardcover book, with tons of projects. Beautifully photographed double page spreads in the beginning show you all the projects. Then the introduction covers tools, techniques and paper types- so if your a complete novice to any of the techniques, you can start just with this book. The introduction covers basics of paper quilling, how to read origami diagrams and how to follow the kirigami instructions. Each technique is in it's own section, and the projects are all marked by shape- sunbursts, stars or snowflakes. First is the quilling- these are gorgeous, lacy designs that are diagrammed very well to show how to glue together the components to create filigree shapes. The technique is wonderful and finished pieces are good for jewelry and ornaments. Origami explains how to make different shapes to work with, starting with cutting a square from a rectangle of paper, then making other shapes. It also shows how the same basic base will look completely different according to the number of sides your base shape has. The bases by themselves are attractive, but then it gets into the projects which develop on those bases for intricate models. Some of those have a lot of folds and are a little bit challenging for me- I'm an experienced paper folder but not an expert. Kirigami is my favorite section. It explains how to fold the paper to cut 2, 3, 4, 5, 6 and 8 sided shapes then shows a bunch of gorgeous snowflakes, stars and sunbursts to cut. There is something so satisfying about opening out a square of folded, cut paper to see the delicate snowflake appear. I absolutely recommend this book- it's one of my favorite books of 2013!